Los Angeles, Jan. 2014: The figurative sculptures of Los Angeles-based artist Ruby Neri appear as if they rose from the deep corners inside earth with exaggerated proportions and colorful surfaces. Some figures have stubby arms open wide in a welcoming gesture; others are more slender with long, tubular noses. A solid head rests alone and another stands limbless with a vase-shaped frame. Neri’s society is truly individualistic by anatomical distortion and there also exists an optimistic air – whether inherent via the artist’s hands or the eyes of an empathizing viewer – to celebrate the oddity. 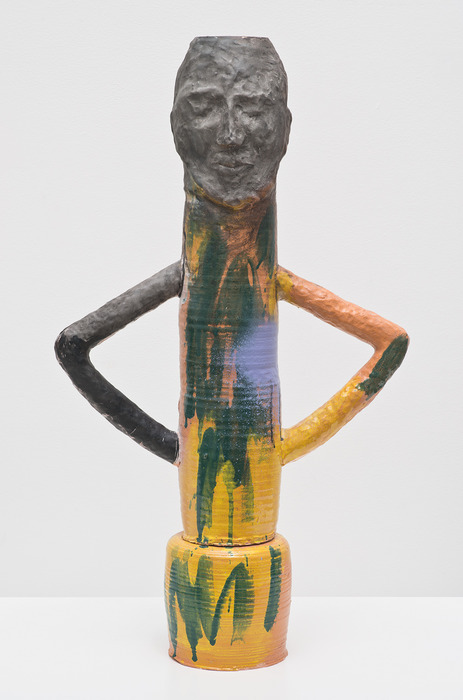 These anthropomorphic sculptures are pulled into the third dimension from the artist’s paintings; the figures on canvas are just as strong: colorful visual abstractions. The work conjures aspects of past art movements in their heyday such as in the geometric planes employed in cubism and the evocation of an emotional experience along with formalities found in German expressionism. It is not so much about the concept with Neri, but about the act – the visceral interplay between her hands and the material – whether with clay and plaster, brush and oil, or spray paint on public walls. In the early 1990s Neri wet her feet in street art, undertook the moniker Reminisce and would later be considered a founding member of the Mission School art movement along with artists Barry McGee, Dan Plasma and Margaret Kilgallen. Painted horses became her trademark and even though she no longer practices graffiti, they still materialize in her artwork today. The subjects in Neri’s work can stand on their own or interact with each other, but they have a home at the David Kordansky Gallery and have been exhibited at the Made in L.A. 2012 group show at the Hammer Museum, the Armory Center for the Arts in Pasadena and at the John Natsoulas Gallery for a solo exhibition. They will also be shown at the 2014 Art Los Angeles Contemporary fair that opens on January 30th. 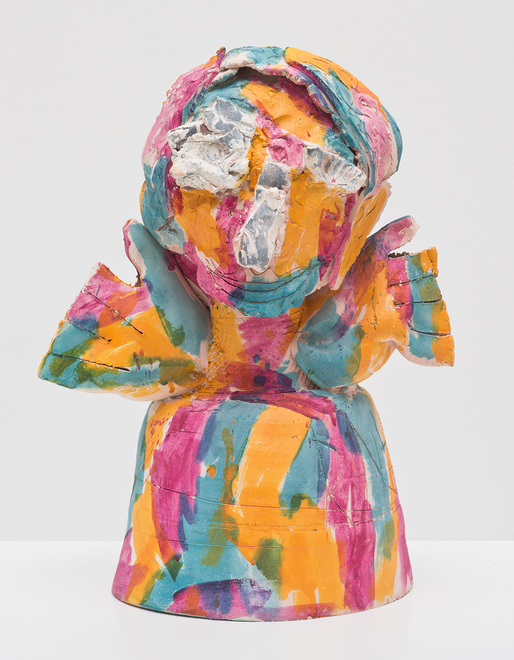 Ruby Neri, Untitled, 2011, ceramic, spray paint and acrylic paint, 25 1/2 x 15 x 10 3/4 inches (64.8 x 38.1 x 27.3 cm); Photography: Brian Forrest / Courtesy of David Kordansky Gallery, Los Angeles, CA. Stephanie Berzon: How did you become associated with the Mission School art movement? Ruby Neri: I attended SFAI from 1989-1994. In 1992 I started doing graffiti with various people who are now associated with the Mission School, some of whom attended SFAI with me. It was a close-knit group of people doing things in a very similar way and I was really bored with art school at the time and wanted to do something free and different. I had already been living in LA for five years and working in a completely different way when the term “Mission School” was first used. SB: So you didn’t know you were part of any art movement until you left it? RN: I was unaware of what I did being termed a movement or the “Mission School” until about 2004. I knew Barry McGee and Margaret Kilgallen always had a very large following. I was really out of the SF art scene I think! SB: While sitting on the panel for the Clay in L.A. Symposium you described your sculptures as your "little army". Who are the figures in your work and what is your relationship to them? RN: Well I really see the figurative elements in my work as merely being a structure within which to work. I am more interested in my relationship with the physical material I am working with and the process and immediacy of the act of making. I think I referred to them as being my little army mostly because of how they were installed in the gallery, in a line with a very frontal relationship to the viewer. SB: During the same discussion you mentioned that your colleagues recurrently compared your paintings to your father's artwork in sculpture. This discouraged you from experimenting with three-dimensional work until you moved to Los Angeles. How did you feel during this transition when you first began to shape plaster and clay? RN: I think I felt more that I didn’t even want to try making sculpture, than actually discouraged from doing three-dimensional work. During under-grad at SFAI all my teachers were either my father’s students or his contemporaries; I felt very limited by this but was unaware of it at the time; I think that was why I didn’t try three-dimensional work. When I came to LA in 1996 I felt very free being away from the Bay Area to try many different things in art making. I think I gravitated towards plaster because I didn’t really understand how to make things three-dimensionally and using plaster was one of the ways I knew sculpture could be made, seeing my father work that way. Clay I discovered when I was teaching art to kids in 2004; I’ve never associated my father working with clay. By the time I was making sculpture with plaster I didn’t care if I was working in a similar way to my father or not; I understood my own interests. 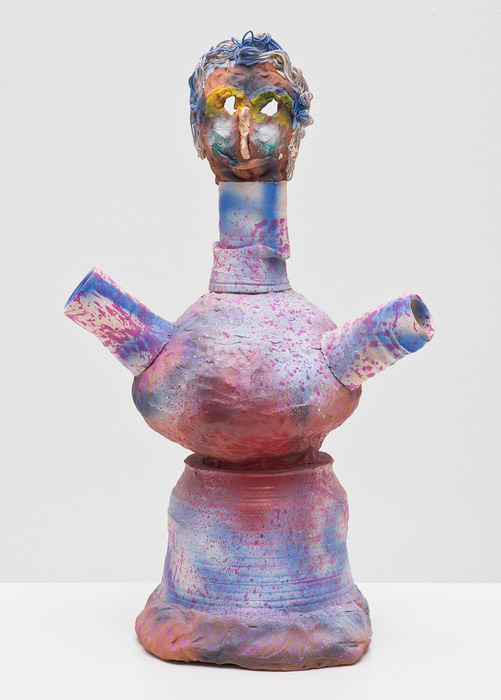 Ruby Neri, Red, Yellow, Blue, 2010, stoneware with acrylic, 19.5 x 10 x 10.5 inches (49.5 x 25.4 x 26.7 cm); Photography: Brian Forrest / Courtesy of David Kordansky Gallery, Los Angeles, CA. SB: How was your creative curiosity as a child affected by your father, Manuel Neri, and his successes as an artist? RN: When I was a kid I wasn’t really aware that what my father did was actually called art. No one actually said to me, “Your father is making art”, or, “Your father is an artist”, it was just what he did. I was way more interested in what my mom did; she is a graphic designer and the fact that she could actually draw people and horses realistically was way more cool and artistic to me. I didn’t consider my father being very interesting artistically until I was basically out of grad school, although his life, friends and interests had an influence on me as a child in an unconscious way, of course. SB: Did you make artwork as a child? RN: I don’t think I was more creative than any other child, but I think that because I had artistic parents, I was perhaps exposed to art at an early age and therefore being creative was very much a part of everyday living. SB: You have previously described your work as being "primarily material based". Can you expand on this? RN: Yes I like to think about my materials that is true. I am not so much interested in the actual representational content as much as the materials and process. I see the final piece as a remnant of a physical process that interests me immensely, and the figure or horse as a structure within which to define my formal interests in sculpture and painting. I believe I came about this interest through experience and intuition. SB: Regarding your process, what is intuitive and what is planned? RN: I think I actually plan what I do in every way, but I am very aware of leaving the relationship with the materials open and intuitive; I don’t like to move the materials too far away from what they are already. I don’t make very many studies or sketches beforehand; I enjoy an intuitive process that produces an idea I have with the materials as a physical remnant. SB: Although the medium of your work has changed, horses can be seen in different stages of your artistic exploration: whether galloping on building walls throughout San Francisco, with figures harnessed atop through thick layers of paint on canvas, or in three-dimensional form. How has the symbol of the horse for you changed over time and do you see this as an ongoing investigation? RN: Well like I said, I see the representational element as a structure to explore my real interest, that being the actual process of creating and working with disparate materials together to create a piece based on reaction, immediacy and process. SB: What underlying differences are there between being a gallery artist and a street artist? RN: Maybe it has to do with financial markets and exclusion, I’m not sure. I know that some street art was seen as a reaction to gallery art at one time. SB: Was your departure from the street scene for galleries a reaction of some sort? RN: No, it was not a reaction at all. Doing street art for me was more social than what I actually considered to be “my art”; the entire time I was doing graffiti I was also making paintings in my studio. When I moved to LA, I was removed from my social scene and therefore I followed other pursuits that interested me more at the time; namely, I was able to focus on a studio practice that interests me still to this day. ArtSlant would like to thank Ruby Neri for her assistance in making this interview possible.